CST signaling pathway diagrams allow you to click on individual nodes to find research resources or product information. You can also download the pathway diagrams for educational and research purposes. Mitogen-activated protein kinases (MAPKs) are a highly conserved family of serine/threonine protein kinases involved in a variety of fundamental cellular processes such as proliferation, differentiation, motility, stress response, apoptosis, and survival. 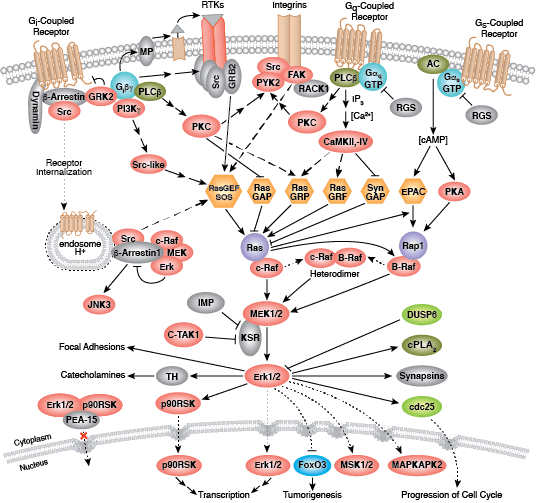 Conventional MAPKs include the extracellular signal-regulated kinase 1 and 2 (Erk1/2 or p44/42), the c-Jun N-terminal kinases 1-3 (JNK1-3)/ stress activated protein kinases (SAPK1A, 1B, 1C), the p38 isoforms (p38α, β, γ, and δ), and Erk5. The lesser-studied, atypical MAPKs include Nemo-like kinase (NLK), Erk3/4, and Erk7/8. 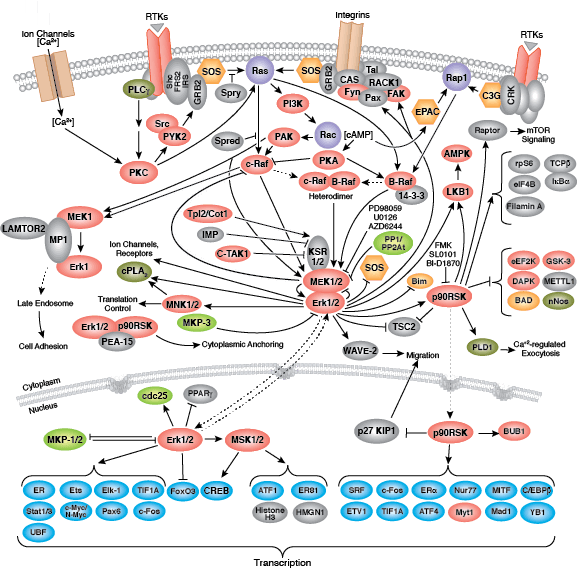 A broad range of extracellular stimuli including mitogens, cytokines, growth factors, and environmental stressors stimulate the activation of one or more MAPKK kinases (MAPKKKs) via receptor-dependent and -independent mechanisms. MAPKKKs then phosphorylate and activate a downstream MAPK kinase (MAPKK), which in turn phosphorylates and activates MAPKs. 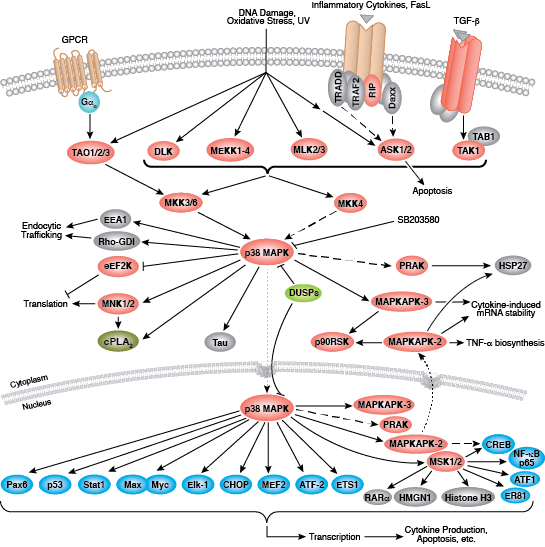 Activation of MAPKs leads to the phosphorylation and activation of specific MAPK-activated protein kinases (MAPKAPKs), such as members of the RSK, MSK, or MNK family, and MK2/3/5. These MAPKAPKs function to amplify the signal and mediate the broad range of biological processes regulated by the different MAPKs. While most MAPKKK, MAPKK, and MAPKs display a strong preference for one set of substrates, there is significant cross-talk in a stimulus and cell-type dependent manner. Arthur JS, Ley SC (2013) Mitogen-activated protein kinases in innate immunity. Nat. Rev. Immunol. 13(9), 679–92. Cargnello M, Roux PP (2011) Activation and function of the MAPKs and their substrates, the MAPK-activated protein kinases. Microbiol. Mol. Biol. Rev. 75(1), 50–83. 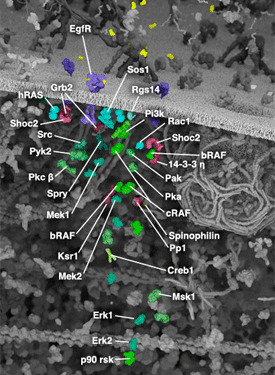 Cseh B, Doma E, Baccarini M (2014) "RAF" neighborhood: protein-protein interaction in the Raf/Mek/Erk pathway. FEBS Lett. 588(15), 2398–406. Darling NJ, Cook SJ (2014) The role of MAPK signalling pathways in the response to endoplasmic reticulum stress. Biochim. Biophys. Acta 1843(10), 2150–63. 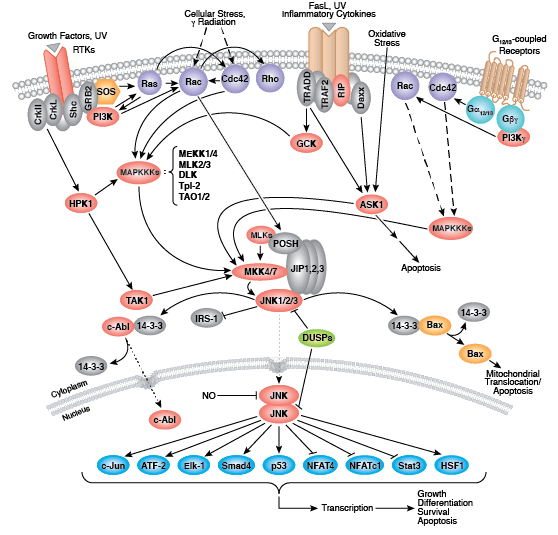 Koul HK, Pal M, Koul S (2013) Role of p38 MAP Kinase Signal Transduction in Solid Tumors. Genes Cancer 4(9-10), 342–59. Plotnikov A, Zehorai E, Procaccia S, Seger R (2011) The MAPK cascades: signaling components, nuclear roles and mechanisms of nuclear translocation. Biochim. Biophys. Acta 1813(9), 1619–33. Sehgal V, Ram PT (2013) Network Motifs in JNK Signaling. Genes Cancer 4(9-10), 409–13.